CanLit for LittleCanadians: The Seven Sequels: They're coming! On October 1, 2014, The Seven Sequels, the seven sequels to The Seven Series, will be launching officially. When The Seven Series hit the shelves in October of 2012, no one could have anticipated its popularity with young readers. I saw boys at school who rarely pick up a library book waiting for the return of a particular volume. I had an intermediate teacher reading an advanced reading copy I had of Ink Me (Richard Scrimger, 2012) and then students relentlessly pestering me about the ETA of the books. And last year, three of the ten nominees for the Red Maple award of the Ontario Library Association's Forest of Reading were volumes in The Seven Series! 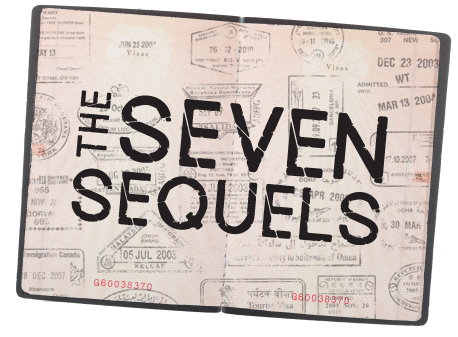 The Seven Sequels will bring seven new titles from the same seven authors who brought us The Seven Series, with the seven grandsons of adventurer David McLean, newly passed, undertaking new adventures that will take them from Cambridge to Uruguay. Here's something else for readers to get excited about: not only will there be digital editions with the classic paper copies, Orca Book Publishers is offering the unabridged audiobooks (i.e., the entire book is read) of the series! (In fact, it's possible to pre-order the complete Seven Series or Seven Sequels as an audiobook collection.) For audiovisual learners, audiobooks are an amazing way for students who learn best by listening to get into books. Personally, I prefer audiobooks as an alternative to the radio while I drive. To help promote the upcoming series and the audiobooks, Orca Book Publishers is giving away free audio samples from The Seven Sequels--one each week until October 1, 2014. The first audio sample is Chapter 1 of Eric Walters' Sleeper and can be downloaded here. New samples can be downloaded at http://www.thesevensequels.com/audio.php each week until the books are out. Look for reviews of the books in The Seven Sequels in the upcoming weeks here at CanLit for LittleCanadians.